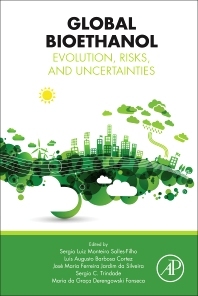 Global Bioethanol: Evolution, Risks, and Uncertainties explores the conceptual and methodological approaches for the understanding of bioethanol technologies, policies and future perspectives. After a decade of huge investments made by big companies and governments all around the world, it is time to talk about the real conditions in which bioethanol will (or will not) evolve. Uncertainties and certainties are discussed and addressed to understand the futures of global bioethanol. The book analyses the evolution of bioethanol in the world’s energy mix under technological, economic and commercial perspectives. It gives particular emphasis on the innovative trajectories of second-generation ethanol and their potential in different countries and regions. Future scenarios are proposed in order to evaluate the possible outcomes of ethanol in a global perspective. For providing a thorough overview of the bioethanol sector from different points of view, this book is a very useful resource for all involved with biofuels in general and bioethanol in particular, including energy engineers, researchers, consultants, analysts and policy makers. Professionals in industry, government and consultancy, students, and researchers in the area of bioenergy, especially those interested in the bioethanol supply chain or any of its particular stages, including feedstock production, conversion, economical aspects and policy. Sergio Luiz Monteiro Salles-Filho is currently head of the Bioethanol Innovation Management Lab (NAGISE) at the University of Campinas, Brazil, where he is full professor at the department of Science and Technology Policy, and where he also founded in 1995 the Laboratory of Studies on the Organisation of Research and Innovation, leading a 20-people research group. As a researcher, Prof. Salles-Filho has dedicated his academic life to the study of STI policy and management, with particular emphasis on policy design, R&D planning and management, multidimensional impact evaluation and foresight studies towards national development and economic and social growth. Luis Augusto Barbosa Cortez full professor at the Faculty of Agricultural Engineering of University of Campinas (Unicamp), Brazil. He started his academic career as a B.Sc. in Agricultural Engineering at the same university, moving on to a M. Sc. at Université Laval, Québec, Canada, and a PhD at Texas Tech University, USA. At Unicamp, he has coordinated the Interdisciplinary Center of Energy Planning and research projects in bioenergy, such as a study on sugarcane ethanol expansion in Brazil, the São Paulo Research Foundation (Fapesp). José Maria Ferreira Jardim da Silveira is a professor at the department of Economics of University of Campinas (Unicamp), Brazil, where he is also a researcher at the Center of Agriculture and Environmental Research (NEA), a member of the scientific council of the Interdisciplinary Center of Energy Research (NIPE), and a member of the board of the International Consortium of Applied Bioenergy Research (ICABR). As an Agronomist, Master and PhD in Economics, he has developed and supervised several multidisciplinary research projects in these areas, and currently develops his research in partnership with the BE-BASIC project of the Technical University of Delft, Netherlands, as part of São Paulo Research Foundation’s (Fapesp) Bioenergy Program BIOEN. Maria da Graca Derengowski Fonseca is a full professor at the Economics Institute of the Federal University of Rio de Janeiro (UFRJ), Brazil, as well as principal of the BioEconomy Research Group and the Infosucro Observatory of Sugar and Ethanol at that same university. She has dedicated her academic career to Economics, on which she has a B.Sc. and a PhD, and Innovation, as Visiting Reserch Fellow at the Centre for Competition and Innovation at the University of Manchester, UK.